Yoga with real, live, goats? It's the latest craze. 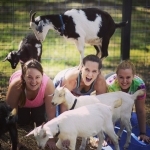 Enjoy an hour of Goat Yoga with one of Chip-in Farm's certified Yoga instructors! Participants will have the chance to take pictures and pet and cuddle with goats during the yoga class! Waiver forms must be filled out in advance. A limited number of yoga mats will be supplied. If you have a mat, feel free to bring it.